Contributes to ongoing debates about the changing nature of law in a global era. Contemporary debates about the changing nature of law engage theories of legal pluralism, political economy, social systems, international relations (or regime theory), global constitutionalism, and public international law. Such debates reveal a variety of emerging responses to distributional issues which arise beyond the Western welfare state and new conceptions of private transnational authority. However, private international law tends to stand aloof, claiming process-based neutrality or the apolitical nature of private law technique and refusing to recognize frontiers beyond than those of the nation-state. As a result, the discipline is paradoxically ill-equipped to deal with the most significant cross-border legal difficulties – from immigration to private financial regulation – which might have been expected to fall within its remit. Contributing little to the governance of transnational non-state power, it is largely complicit in its unhampered expansion. This is all the more a paradox given that the new thinking from other fields which seek to fill the void – theories of legal pluralism, peer networks, transnational substantive rules, privatized dispute resolution, and regime collision – have long been part of the daily fare of the conflict of laws. The crucial issue now is whether private international law can, or indeed should, survive as a discipline. This volume lays the foundations for a critical approach to private international law in the global era. While the governance of global issues such as health, climate, and finance clearly implicates the law, and particularly international law, its private law dimension is generally invisible. This book develops the idea that the liberal divide between public and private international law has enabled the unregulated expansion of transnational private power in these various fields. 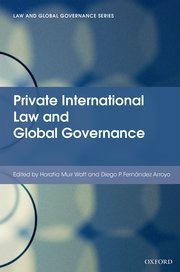 It explores the potential of private international law to reassert a significant governance function in respect of new forms of authority beyond the state. To do so, it must shed a number of assumptions entrenched in the culture of the nation-state, but this will permit the discipline to expand its potential to confront major issues in global governance.